Yippy. Looks just like the Bloomberg tower. Anyway, the stretch of sixth from 34th to 23rd is now one of the blandest, most sterile, boring stretches in the city. It literally had more flavor WITH the parking lots, and that's quite something to say! Most people have absolutely no reason to ever go there unless they are one of the new residents. 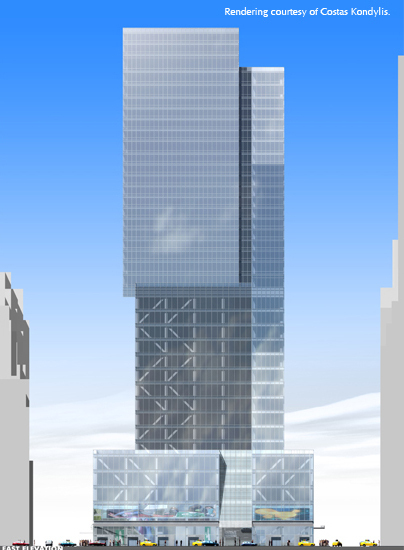 I wouldn't mind the banal and tacky looking towers if the development at street level would have been acceptable. No, the streetlife has been destroyed and removed. Some of the buildings should have been FORCED to contribute to maintaining and developing a sense of place, instead of creating a joyless corridor between real neighborhoods. FORCED to accommodate the florists and other businesses they displaced with bank branches. They could have preserved the elements that gave the area life, charm, and a unique identity and still developed up to the sky to make their money. There is no coordination, no thought, no neighborhood planning in New York anymore, just pigs at the trough and this stretch of Sixth is exhibit #1. Now they'll add another bland tower with a grotesque base and an indoor mall filled with the same 20 chain stores you see everywhere else. Yay. Does any new development have a 'neighborhood' type shop? There might be a need for affordable renting for small businesses too, if such a thing doesn't already exist. That was a pretty nice building. 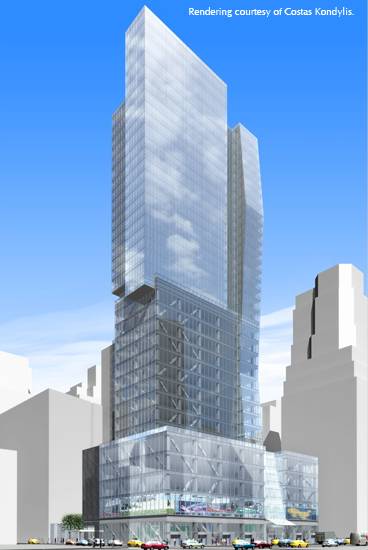 This will be Costas' sixth tower on a stretch of 5 blocks. This section of 6th Ave will become the banal residential counterpart of the 6th Ave north of 42nd. Its interesting how a lot of the interesting architecture gets squished into a corner of W 18th/19th in Chelsea or a couple streets on the Lower East Side and Tribeca. Maybe I dislike it just because it's from Kondylis? 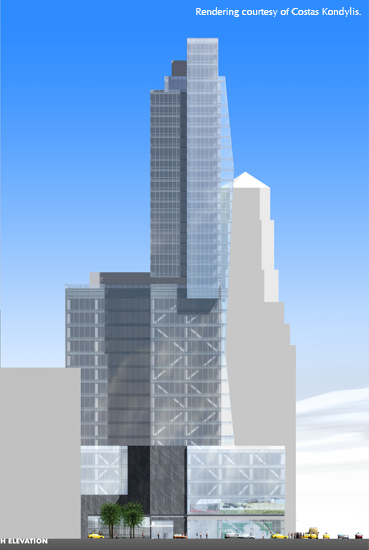 I like the way he hides the bulkier office portion of the tower in the back as seen in the "south elevation" (or the 3rd one from the top). We often criticize him (and deservedly so) but in this instance, he should get praise for that bit of creativity there. I see nothing here that deserves to be called "creativity". Just lots of visual trickery to make this pile look less massive in the render. And yeah yeah yeah I know "It could be just another boring box, so we should be happy." Show me a display of real talent and then I'll be happy. No doubt when this one is finished it will look like a hodge-podge of recent Kondylis projects -- and have no real identity of its own. 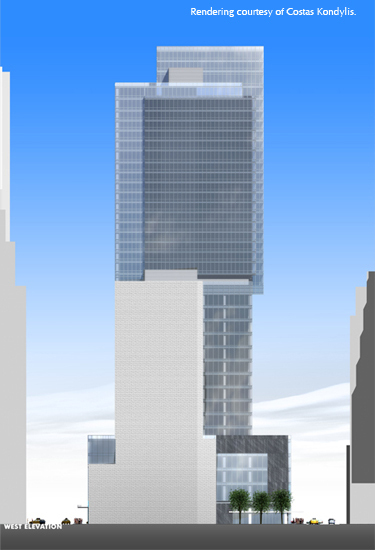 And WTF is that stupid accordion-like ski-slope thing on the north end of the building? That may be a sight we'll have to get used to over the next few years as the financial crisis continues. The idiot developer also razed a gorgeous building that was on this site as well. So not only did we lose a beauty but now have to live with a dirt hole for the next 5 (or more) years. Last edited by antinimby; September 19th, 2008 at 10:31 PM. 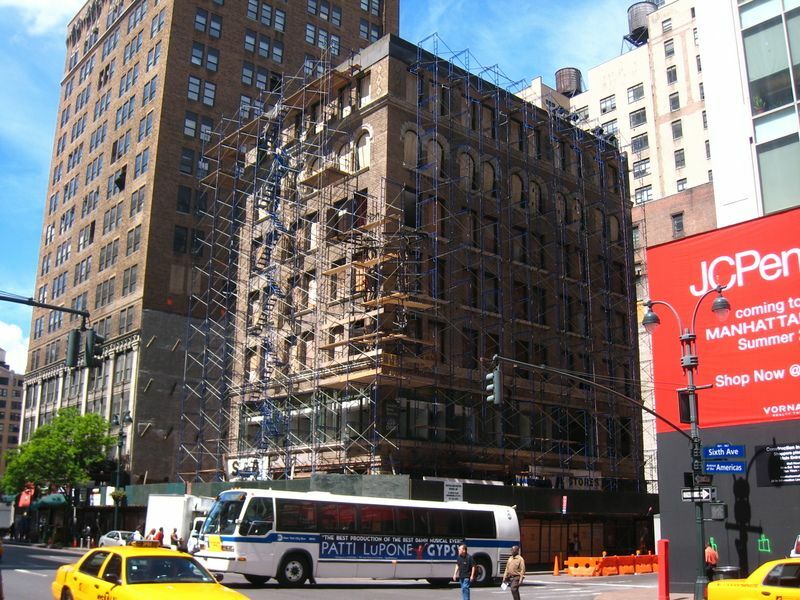 In March 2007, Tessler Developments and the Chetrit Group entered into a loan agreement with Fremont Investment & Loan to acquire 855 Sixth Avenue, a site near 31st Street. The loan was part of a massive portfolio that Fremont, one of the nation's largest subprime lenders, sold to Manhattan-based Istar Financial. Copyright © 2008 – The Real Deal, Inc.
Not bad news, didn't expect construction to begin any time soon . At least now, the project could resurface with a better design in a few years. Shame that building had to be demolished. Well given current economic condition getting 2 out of 3 on sixth avenue is not bad, plus we are still getting the two with the most impact (>500ft)on the lower midtown skyline. This bldg(855) was slated to be less than 500 ft.